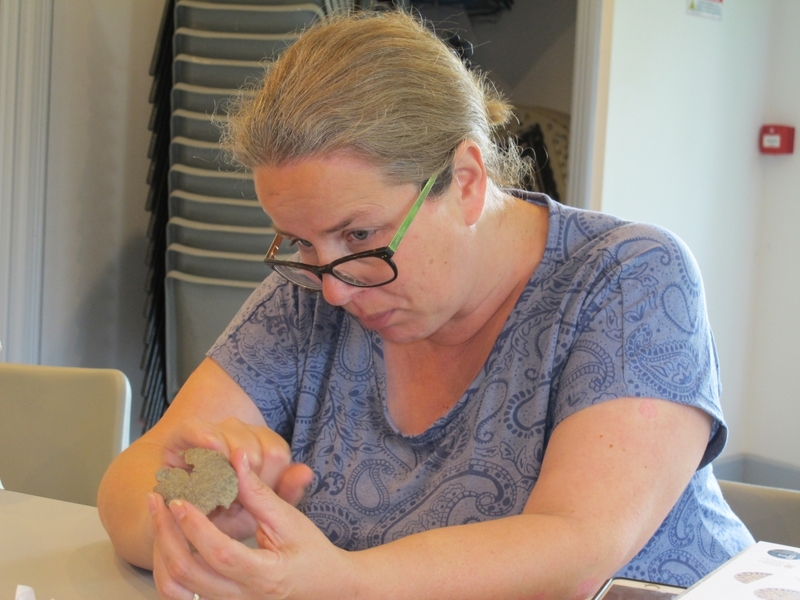 An unexpected result of the Saturday 14 July session at Gold Hill Museum with Ciorstaidh Trevarthen, Finds Liaison Officer for Dorset and Somerset (above), was the significant re-dating of what was already thought to be the Museum’s oldest artefact. A hand-axe, currently labelled as a 200,000 year old Acheulean specimen, appears to be considerably older, with a date range of 500,000 to 250,000 BCE. Ciorstaidh advised that it was a particularly good example, finely made by a species of human predating Homo sapiens. It was found on Castle Hill, Shaftesbury, and may have belonged to one of the earliest Shastonians. The morning linked in with the Museum’s Found Underground exhibition, where visitors are able to handle and identify mystery objects. With her wealth of knowledge and experience, Ciorstaidh was able to shed light on garden finds brought in by members of the public including pottery, metal and glass objects, and a ring which was definitely not from a Christmas cracker! She also identified 15th century buckles and a knife end, a medieval thimble and a small piece of multi-coloured Roman glass.